This morning AS Roma unveiled the proposed Woods Bagot designs for Stadio Della Roma, the club’s new 52,000 seat state-of-the-art stadium at Tor di Valle, to the south west of Rome city centre. . It is scheduled for completion in the Summer of 2016, with the design being inspired by The Colossuem, the most iconic building in the city. “The design draws visual cues from the world’s most historic spectator venue, the Roman Colosseum,” says Woods Bagot Sport Design Leader, Dan Meis. “For an architect who has spent much of his career designing stadiums, and most of his vacations in Italy, the Stadio della Roma truly is a project of a lifetime. “Rome has an unparalleled architectural history. To be able to build anything there is a gift, to build a new home for AS Roma and the most passionate fans in football is heart stopping,” says Meis. The design features a state-of-the art steel and concrete seating bowl wrapped in a ‘floating’ stone scrim, evocative of the rhythmic facade of the famous arena; with polycarbonate clad roof is reminiscent in form of the historic retractable fabric canopy that once covered the upper tiers of the Colosseum. The result is an extremely dynamic and contemporary form, firmly grounded in the rich history of Roman architecture. A distinctive feature of the design is the new ‘Curva Sud’. Long recognised as the section of the existing Stadio Olympico that is home to AS Roma’s ultra-supporters, the new stadium will have a steeply pitched, clearly delineated separate section of 14,800 seats, with a more ‘muscular’ and raw architecture to provide a clear and unquestionable identity as the heart of AS Roma fans. The architecture enables the stadium to be easily configured to multiple stage configurations, including retractable stage canopies, rigging, and turf protection systems, providing extreme flexibility as a concert venue with an expansion capacity of 60,000. Stadio della Roma will be the first truly sustainable major sports venue in Europe that incorporates a carbon neutral footprint, maximum recycling capabilities and state-of-the-art renewable energy and conservation programs. Amplifying the game-day experience has been integral to the design. The new stadium’s sightlines and proximity to the pitch are designed to deliver a vivid and action-packed fan experience. Every seat will offer unparalleled views of the action; along with stadium-wide WiFi capability and mobile connectivity. There will also be super-premium club seating section of 600 seats in the lower bowl with direct access to a pitch level club offering views of the teams as they exit and enter the pitch. Another special feature of the pitch level is a massive hydraulic lift allowing a dramatic entrance for the players during warm-up, reminiscent of the gladiatorial lifts in the historic Colosseum. “It is very exciting to have such a significant project as my first stadium designed with Woods Bagot. Stadio della Roma will be one of Europe’s most sophisticated stadiums and will be groundbreaking in the inclusion of a significant ancillary development of restaurants, entertainment and training facilities, creating a 365 day destination,” says Meis. Led by Meis, Woods Bagot is delivering the architecture for the stadium design with a dedicated design team based in Woods Bagot’s Los Angeles, New York and San Francisco studios. “We are very proud to be associated with AS Roma, a major club with a long and proud history,” says Ross Donaldson, Woods Bagot Group Managing Director. The stadium will be located at Tor di Valle, south west of the historic city centre. Scheduled for the 2016-17 Serie A season, costs are estimated at US$400 million. 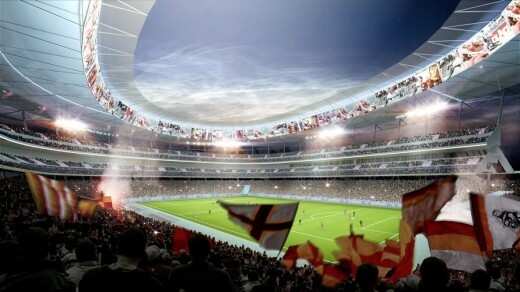 The new home of AS Roma has been unveiled with plans for a premier state-of-the-art football stadium, incorporating the industry’s most sophisticated spectator technologies, security and fan amenities. With an intimate seating bowl of 52,500 seats, natural grass pitch and a PTFE canopy covering 100% of the stadium seating, Woods Bagot design for Stadio della Roma is set to become a category-defining football and multi-purpose entertainment venue for Italy and Europe.